Legendary boxing trainer Cus D'Amato devised the peek-a-boo boxing style as a way to protect the head and body from unnecessary punishment. 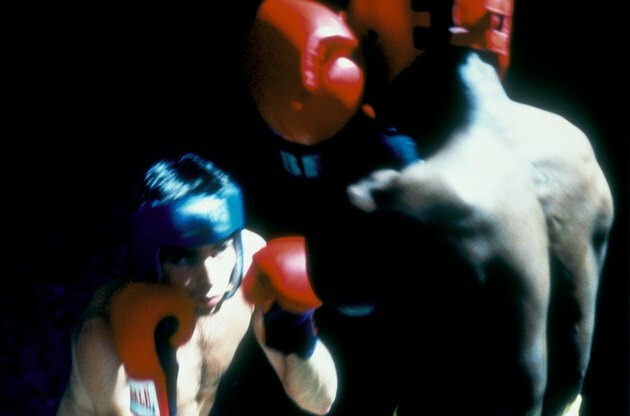 D'Amato instructed his fighters to hold their gloves high in front of their faces, offering protection from punches while still allowing them to peek out at their opponents. Successfully employing a peek-a-boo defense requires a few basic elements. An effective peek-a-boo defense relies on proper glove placement. Hold your gloves side-by-side in front of your face with your fists pointed up and your elbows down. Your gloves should cover your entire face up to your eyes, protecting your nose and jaw. Maintaining your gloves in this position allows you to absorb jabs and head punches without losing sight of your opponent. Keeping your gloves up like this will also allow you to slap aside any looping hooks. While the gloves protect your face, you need to keep your arms and elbows tucked tight to your body to protect your ribs. If you let your arms hang loose, your opponent will be able to dig hooks to the body. Keep those elbows tight. And if you see a body shot coming, try to catch it with your arm to absorb the blow. A good peek-a-boo boxer fights from a crouched stance with his chin tucked and his shoulders hunched forward. Standing tall and erect in a peek-a-boo stance exposes more of the torso, leaving you vulnerable to body shots. You want to keep tight and compact, guarding against as much punishment as possible. A proper peek-a-boo guard alone won't be enough to prevent a beating if you're presenting your opponent with a stationary target. To be a great defensive fighter, you need to combine the peek-a-boo stance with constant head movement. Bobbing and weaving makes you more difficult to hit and enhances the peek-a-boo's effectiveness. While a defensive stance, the peek-a-boo allows for strong counterpunching. Since your gloves are already up, you'll be able to fire quick, short jabs. Bobbing and weaving from a peek-a-boo stance also lends itself to a powerful 2-3-2 combination, which entails a left hook to the body, a straight right to the head and another left hook to the body. If you want to master the peek-a-boo stance, study the boxing greats who used it to become world champions. D'Amato taught the style to heavyweight champs Floyd Patterson and Mike Tyson. Former light middleweight champ Winky Wright also employed the peek-a-boo style to tremendous success.